After a successful debut last year, KAABOO Del Mar released the lineup for its three-day music festival. 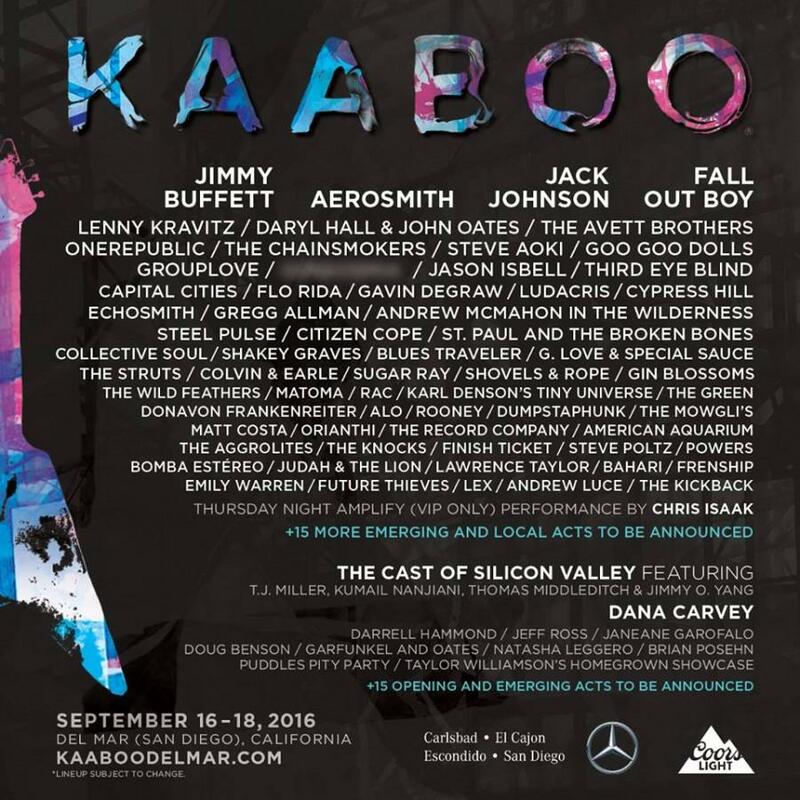 Some 71 artists were announced to appear for KAABOO’s second edition in mid-September. During its inaugural run, KAABOO featured The Killers, No Doubt and Zac Brown Band to positive response. Classic rockers Aerosmith, alongside Jimmy Buffet and Jack Johnson will headline the event this year. Also joining the festivities are Lenny Kravitz, Daryl Hall and John Oates, Fall Out Boy, Goo Goo Dolls, Chris Isaak, One Republic and many more. More than just an ordinary music festival, its creators are dubbing KAABOO as an experience. It’s an apt description for the unusual festival amenities that are offered during the three days, like cabanas, a swimming pool overlooking the main stage, a masseuse in the VIP area, private beach outings and more. Price for the event is $249 for general admission three-day pass, with single-day tickets going on sale shortly before the festival, depending if the event is not sold out. KAABOO will take place at the Del Mar Fairgrounds on Sept.16 to18.